"Chelsea Police investigate two separate murders in area today"
This is not what you want to see on the TV news headline as you are sitting down to dinner in Chelsea. Steve and I went to Newbridge Café, a hole in the wall that has been around for almost 40 years and is famous for their steak tips. Steve noted that Zagat's gave them a 7 for décor. That's 7 out of 30, folks. It was 7pm on Saturday night and a line formed adjacent to the bar, but when I spoke to the hostess she offered us a middle table (in the middle of the upper level room) or a 15-20 minute wait. We opted for the cramped table. 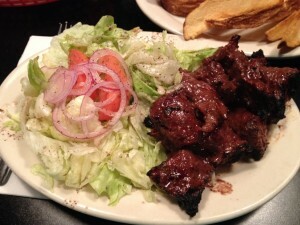 We both ordered the same thing: steak tips, medium rare with salad ($17) and an order of fries ($5) to share. The tips lived up to their reputation. We each got a generous portion of perfectly medium rare meat that was tender and flavorful. The salad was a mountain of iceberg chunks with 2 segments of sad, pale tomatoes, and some red onions. 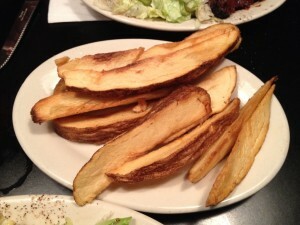 Our steak fries were huge potato planks – they didn't taste fried, but dehydrated. The reviews I read had knocked the service, but our waitress was friendly enough and efficient. We got several "how you doing?" during the meal and she was speedy with water refills and our check. Despite the delicious tips, I don't think I'll go back. There are plenty of occasions, events, social gatherings where I'm the only non-Caucasian in the room and it is seldom an issue, however, sitting in the middle of the dining room, in this restaurant, I definitely caught a few looks. I guess I can't assume it's about race, or being in a inter-racial couple, but there was definitely something going on and it was uncomfortable. The only other time I have felt this way in a restaurant was Santarpio's, over a decade ago. I was glad when we paid the bill and left.